Castle Hill Red Cross has done it again and has been awarded the prestigious Chairman’s Shield for the eighth time. Since October 1989 the Castle Hill branch has raised over $1 million and during this year’s Red Cross Calling appeal, nearly $28,000 was raised. The club first won the Chairman’s Shield in 2006 and was a winner for the next two years. It won again in 2010 and then the next two years and was a winner last year. 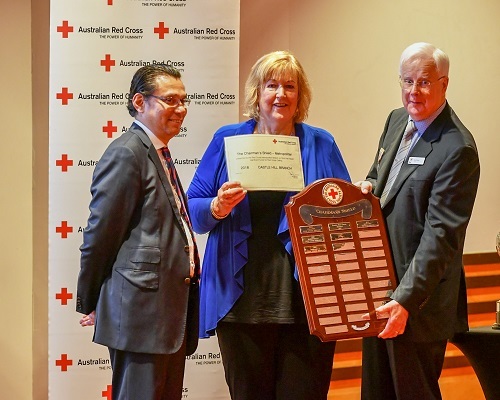 Castle Hill Red Cross Club President, Donna Fraser said: “Our members were delighted to be awarded the shield again and wish to sincerely thank the generous people of The Hills for their continued support without which this award would not possible for us to achieve. Castle Hill Red Cross meets on the second Friday of the month at Wesley Uniting Church, 132 Showground Rd, Castle Hill at 10.15am. For details call Donna on 0416 082 626.